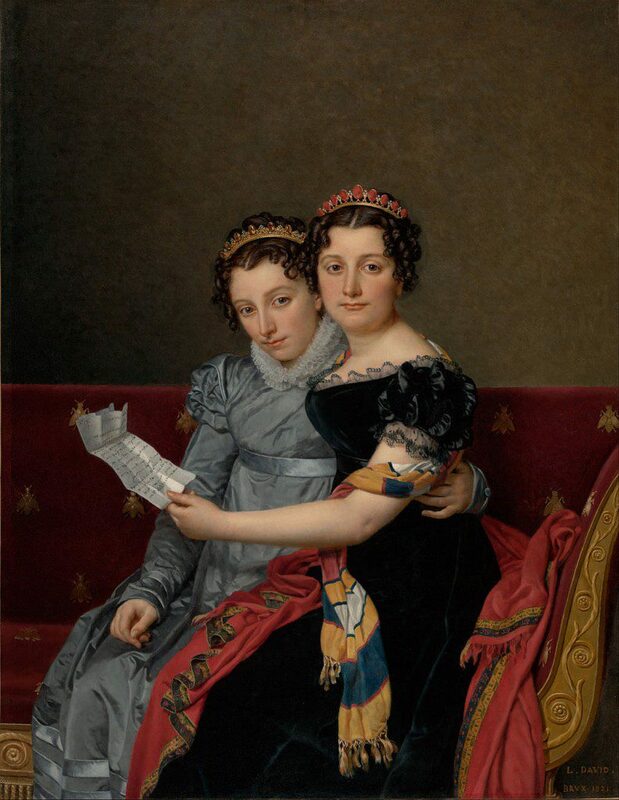 The Sisters Zénaïde and Charlotte Bonaparte by Jacques-Louis David, 1821. Charlotte is on the left, behind Zénaïde. Painted in Brussels, the sisters are reading a letter from their father Joseph, who is in America. Charlotte Bonaparte – the daughter of Napoleon’s brother Joseph – was intelligent and cultivated, with a romantic temperament. Known for her talent as an artist, Charlotte lived with her father in the United States for three years, where she drew and painted a number of landscapes. In Europe, she studied with Jacques-Louis David and with Louis-Léopold Robert, who killed himself when his passion for her was not requited. Constrained by Napoleon’s will to marry her cousin, Charlotte made the best of the situation, though her short marriage ended in sorrow. She herself died in sad circumstances at a relatively young age. Charlotte Napoléone Bonaparte was born in Mortefontaine, France on October 31, 1802. She was the second child of Napoleon’s brother Joseph Bonaparte and his wife Julie Clary. Charlotte’s sister Zénaïde had been born a year earlier. In appearance, Charlotte took after her mother: small and thin and not considered a beauty, though she did have lovely large, dark eyes. In temperament, she was more like her father, with a zest for life and a passion for art and literature. If it would enter among the Emperor’s arrangements to marry Zénaide or Lolotte with Napoléon [Louis’s son, whom Napoleon wanted to adopt], instead of a stranger, I would be happy since, by adopting our nephew, the Emperor could amass on him all his affections without my honour being wounded…. It is more than likely that we will not have any boys: in that case, what would be more glorious for me than to centre all my affections on the same child, who would also become mine? I think you could say a few words to the Emperor about it, if he offers you the opportunity…. Charlotte Bonaparte was not yet 13 when her father escaped to the United States after Napoleon’s 1815 abdication. Julie and the girls remained in Paris until they, too, were forced into exile. They went first to Frankfurt, where they lived until 1820. They then moved to Brussels. Though life was not as luxurious as it had been, Charlotte – who started drawing lessons at an early age – had the good fortune to study in Brussels under Jacques-Louis David, considered to be one of the best painters of the time. As Joseph Bonaparte called himself the Count of Survilliers, Charlotte Bonaparte became known as the Countess of Survilliers. Joseph worried that life at his Point Breeze estate in Bordentown, New Jersey, would seem dull to a young person accustomed to living in Europe’s grand cities. He sought to keep Charlotte busy. He took her to upstate New York, where they visited Niagara Falls; to Ballston Spa, where they stayed at the Sans Souci Hotel; and to Schooley’s Mountain Spring in New Jersey, where they stayed at Belmont Hall. Charlotte also dodged idleness thanks to her love of drawing and painting. Shortly after her arrival in the United States she wrote to her mother that she had painted a small landscape, her first one in oil – a view from her Point Breeze window. In the spring of 1822 she submitted a painting entitled “Landscape and Waterfall” to an exhibit at the Pennsylvania Academy of the Fine Arts. The following spring the Academy exhibited 10 of her drawings and, in 1824, two of her landscapes. In January 1823 Joseph commented in a letter to Julie that Charlotte worked all the time on her painting. (4) He often took her to the Athenaeum in Philadelphia. Joseph and Charlotte received many visitors. Charlotte became good friends with one of Stephen Girard’s three orphaned nieces, Caroline, the sister of Henriette Lallemand. She was also friends with Joseph and Emily Hopkinson and their daughter Elizabeth. Charlotte was, apparently, oblivious to the fact that her father had a mistress (Annette Savage) living nearby, and that he had two young daughters in the United States: one of them (also named Charlotte) born, and another one killed, in a tragic accident at Point Breeze, during Charlotte’s stay there. Joseph continued to be concerned about finding appropriate spouses for his daughters, the subject of much correspondence between him and Julie. Adhering to the instructions in Napoleon’s will that his nieces and nephews should marry amongst themselves to conserve the Bonaparte wealth, it was agreed that Zénaïde would marry her cousin Charles (the son of Lucien Bonaparte) and that Charlotte would marry her cousin Napoleon-Louis (the son of Louis). As shown in Napoleon in America, there was an effort on the part of Joseph’s mother Letizia and his sister Pauline to have Charlotte wed Jerome (Bo) Patterson Bonaparte, the son of Napoleon’s youngest brother Jérôme and his American-born first wife, Elizabeth (Betsy) Patterson (more about them in future posts). However, as Napoleon had never recognized that marriage, or Bo’s credentials as a Bonaparte, Joseph did not fancy the idea. Joseph also considered and discarded the possibility of a marriage between Charlotte and one of his sister Caroline’s sons, Achille and Lucien Murat. In view of her impending marriage and her mother’s poor health, Charlotte Bonaparte returned to Brussels in August 1824, after Zénaïde and Charles had come to stay with Joseph. She was accompanied by two of Joseph’s servants, who were charged with attending to the sale of Joseph’s château of Prangins in Switzerland to raise money for Charlotte’s dowry. Charlotte and Julie obtained passports to depart for Italy, where most of the Bonapartes were living. The newlyweds divided their time between Florence, where Julie and Louis lived, and Rome, where Zénaïde and Charles had established themselves on their return from America. Pauline Bonaparte, who died in June 1825, had bequeathed the Villa Paolina to Napoleon-Louis, knowing he was going to marry Charlotte. Napoleon-Louis was two years younger than his wife. At first Charlotte found him immature and he found her rather humourless, but they grew to love each other. Sadly, they did not have long to enjoy married life. On March 17, 1831, Napoleon-Louis died while fighting for the insurgents who were trying to drive the Austrians out of Italy. The official cause was listed as measles, but he may have suffered a bullet wound. Charlotte had disapproved of his revolutionary activities. After her husband’s death, Charlotte lived with her mother at the Villa Serristori in Florence. In late 1832, she went to London to visit Joseph, who was temporarily living near Regent’s Park. She considering going back to America with him, but, as she was in poor health, decided against the Atlantic crossing. She returned to Florence in October 1833. Charlotte’s salon in Florence attracted a lively group of writers, poets and painters. Among the visitors Charlotte received there was a young, married Polish aristocrat, Count Potocki, who is said to have become her lover. In 1838 Charlotte became pregnant. To hide the pregnancy from her mother, she went to stay with Zénaïde and Charles in Rome. Keen not to give birth where she was known, in February 1839 Charlotte sailed with her physician for Genoa, intending to have the baby there. A storm compelled the ship to land at Leghorn, from where they proceeded overland. With the bumping of the carriage, Charlotte began to hemorrhage. They stopped at Sarzana, where Charlotte underwent a caesarean section. The baby died shortly after birth. Soon after, on March 2, 1839 (probably in the night, as some sources say March 3), Charlotte herself died from loss of blood. She was 36 years old. She added that Julie had already given her share to the children. Charlotte’s remains were transported to Florence and entombed in the Basilica of Santa Croce. 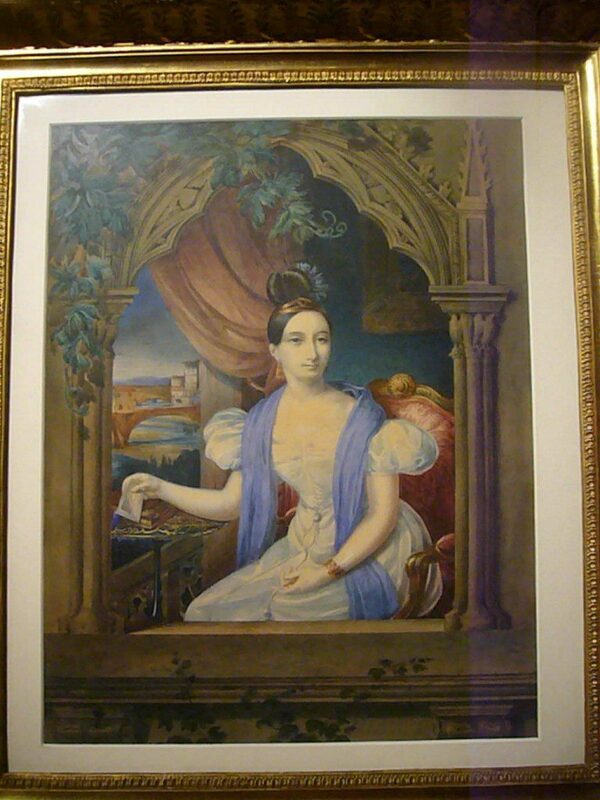 The inscription reads: “Here lies / Charlotte Napoléone Bonaparte / Worthy of her name / 1839.” Many of her drawings and watercolours are in the Museo Napoleonico in Rome. You can see some of Charlotte Bonaparte’s American drawings on the New York Public Library digital gallery. A. du Casse, ed., Mémoires et Correspondence Politique et Militaire du Roi Joseph, Volume 10, (Paris, 1854), pp. 400-402. Georges Bertin, Joseph Bonaparte en Amérique: 1815-1832 (Paris, 1893), pp. 258-259. M. Woodward, Bonaparte’s Park, and The Murats (Trenton, N.J., 1879), p. 78. Patricia Tyson Stroud, The Man Who Had Been King: The American Exile of Napoleon’s Brother Joseph (Philadelphia, 2005), p. 99. Eugène Lemoine Didier, The Life and Letters of Madame Bonaparte (New York, 1879), p. 188. Joseph Bonaparte en Amérique, p. 272. The Man Who Had Been King, p. 195. You really ought to get the Museo Napoleonico catalogue. It is a wonderful work. Worth learning to read Italian for, if you can’t already, as I expect you can. Is it true she had one shoulder higher than the other? Thanks, Geoffrey. I don’t read Italian, but I see I’m in luck, as it’s also available in French, which I do understand: http://www.boutiquesdemusees.fr/en/exhibition-catalogues/exhibition-catalogue-charlotte-bonaparte-1802-1839-une-princesse-artiste/2083.html. I don’t know the answer to the shoulder question. This is the first I’ve heard of it. I think the French catalogue is for another exhibition. The Italian catalogue would be worth having for the illustrations alone, even if you can’t easily read the text. It is very profusely illustrated, with her works and contemporaries’. There is an interesting chapter about the Bonaparte family reunion in London in 1833, when English art was at a very high point, and Charlotte would have been able to see the work of people like Turner, Constable and Cotman. I went to see the Museum in May 2014. It has a lot of interesting things on show and probably lots more in the archives or storerooms. A lot of lovely paintings, some well-known, others not at all. They have documentation in several languages, as far as I remember. In September 2014, on a trip to Florence, I visited the Church of Santa Croce where Charlotte is buried together with her mother. The Church is worth a visit, mainly to see the tombs of some of the great minds of Italy (Galileo, Machiavelli, Rossini, Michelangelo,……). Thank you, Antonietta. I really appreciate the correction. I will update the post accordingly. Thanks, Anna. Glad you liked the article. Joseph’s Charlotte was also called Lolotte as an endearment by her family. I have a download of a sketch dated 1823 that was done by Charlotte. It is titled Vue de Lebanon. It is clearly a sketch of our town possibly done on a visit to the Stevens family. That sounds lovely, Joe. I gather the sketch appears in Vues pittoresques de l’Amérique dessinées par la Comtesse Charlotte de Survillier (1824). The New York Public Library digital gallery (see link above) shows four of the drawings in the series, but unfortunately not the view of Lebanon. There’s a fuzzy reproduction of it here (p. 5): http://www.lebanontownship.net/newsletters/Spring07Newsletter.pdf. That’s it! Thanks for the lead. It was in a Rutgers “Woman in NJ Arts” exhibit. I believe she was visiting the Stevens and Livingston family who she knew from Robert’s time in Paris as our minister. I would like to use it in a publication. You’re most welcome! Good luck with the publication. I see the Met believes that the “Vue de Lebanon” was of Lebanon,NY. As the historian in Lebanon NJ I can say it looks remarkably like a view from the north of Lebanon Boro looking toward Round Valley. That Valley was the home of RR Livingston’s wife and she was obviously familiar with the Bonaparte girls from the time her husband was ambassador to France when he negotiated the Louisiana Purchase. We know she visited Schooley’s Valley come down through German Valley and there we are! Our 1817 Church and the turnpike can be discerned. Who can I talk to about the NY attribution? Well-spotted, Joe. Charlotte’s view is undoubtedly that of Lebanon NJ, as referred to in an article in the New Jersey Historical Society Magazine of January 1963, reprinted on p. 5 of the Spring 2007 issue of the Lebanon Township News (http://www.lebanontownship.net/newsletters/Spring07Newsletter.pdf). As the lithograph is in the Met’s “Prints” collection, I suggest that you contact the Met’s Study Room for Drawings and Prints (https://www.metmuseum.org/art/libraries-and-research-centers/study-room-for-drawings-and-prints; tel. 212-570-3920) to correct their mistake. Another view in the series, The North [Hudson] River near Clermont, supports Charlotte’s relationship with the Livingston family, as Clermont was the Livingston family estate. Any idea where I might find an image of La Source à Schooley’s Mountain? I haven’t seen La Source à Schooley’s Mountain, Jean. Apparently it’s in the Met’s collection, but their website does not have a digital image of it; neither is it on display: https://www.metmuseum.org/art/collection/search/381213. The young man, they say, showed no small reluctance to marry this hideous little creature… [S]he is said to be a vixen.